With two warm days behind us and a few more to go the trails have taken a hit as the meltdown has begun. 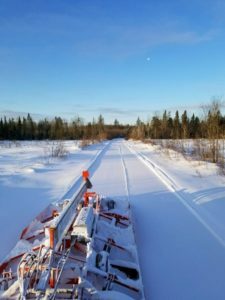 Riders are still reporting good trails in the woods, going to the flowage, and around the area, but the in town, town roads, and railroad grade are melting away fast. As soon as you get out of town and into the woods the trails are Good. 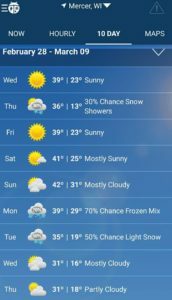 Some colder temps and possible snow next week leaves us to say we are not done yet. The 12″ received last week has added to our base. Our advice is next weekend might be better than this weekend, but if you want to ride you can find some good riding! Monitoring a little warm up this week, but after Wednesday we drop back down to normal temps and have a chance to pick up a little Lake Effect snow. Trails as of today are still in Good Condition with some areas reporting icy corners and Trail 17 (the grade) being thin. Overall excellent riding this week reported by all riders. As you can see most of our trails are in GOOD condition. During the weekend with lots of traffic you may find some icy corners and the Railroad Grade (Trail 17) is thin. Overall, everyone we have been talking about this week has been reporting good trails all around the area including our trail system. 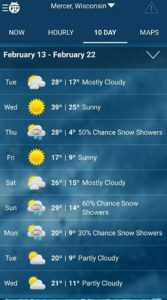 Temperatures will remain below freezing in the extended forecast and lake effect snow still shows up when it wants to. We are projecting this to be a GOOD weekend to be riding the Mercer Area Sno Goers Trail System. Please ride safe and have a great weekend! This weekend and next is almost full at the Great Northern but the week day riding has been amazing, book your trip today!